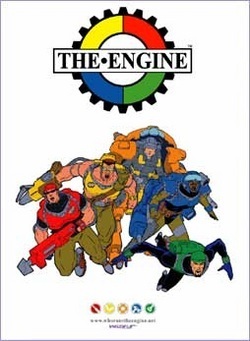 Key to Renard's subversive strategy, code-named Industrial Strength, is The Engine™ -HGV™, Steampress™, Axel™ and Shift™ - a hard-bitten crew of freelance mechanical troubleshooters. They go where others fear to tread, into the heart of the monstrous machines teetering on the brink of catastrophic collapse. Together they must turn back the relentless march of industrialisation… by force if necessary.